You reported – we acted. Cycle contraflows, if designed inclusively and well, can be a powerful tool in a city’s cycle network. We previously reported about contraflows here. Our streets are changing throughout the city – you may have seen white road markings appear on Clayton Street – part of the recently finished Central Station works. You may even have stopped and wondered what it was and what it did. It’s Newcastle’s first cycle contraflow and sadly the safety of its design is lacking as the space is not protected from vehicle invasion. 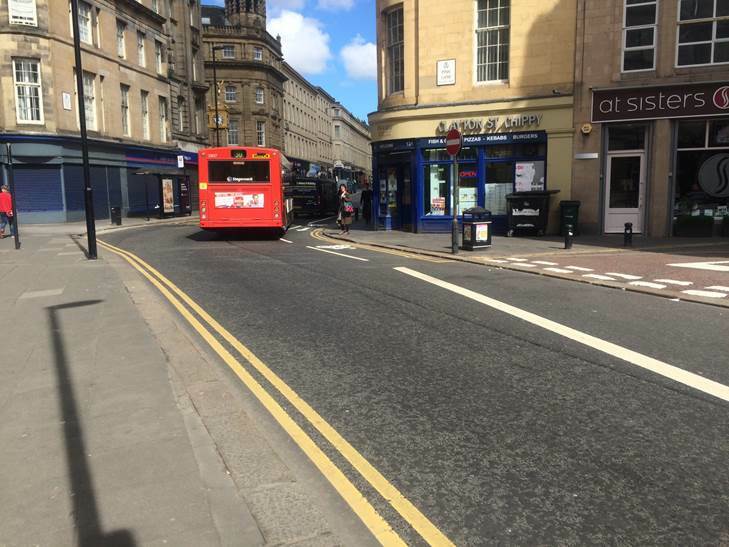 It would be great to get Newcastle’s first cycle contraflow usable and feeling safe. We have hence expressed our concerns to Newcastle City Council and asked what’s happening on Clayton Street – see our request to them below. The answer we received stated that within the next two weeks small-ish plastic separators pieces called Orcas will be installed as a method of protection from motor traffic. Good? We are not entirely sure this measure will offer sufficient protection and asked council to, at least, monitor the situation closely and upgrade swiftly if necessary. We think it’s great that Newcastle council has finally started to design some cycling into the roads and some implementation underway. But now it must be about getting the design details right. Auditing works and listening to user concerns should be part of the council’s toolkit too. First we heard about this contraflow was on twitter when a Campaign member alerted us to the freshly painted but dangerous arrangement. Eyes and ears are out there. Keep it coming, together we can make Newcastle a Cycle City. Having observed this for a while, we now have to express our sincerest worries and concerns about the cycle space recently painted on Clayton Street, city centre. It is a cycle contraflow. We ask you to understand that we generally welcome cycle contraflows, however that there are some details to consider too when installing them. On this occasion the road design puts the cyclist in a dangerous situation. Particularly, as the cycle contraflow is on an outside of a bend, drivers can more easily stray by taking a direct, straight path, and enter the cycle space. 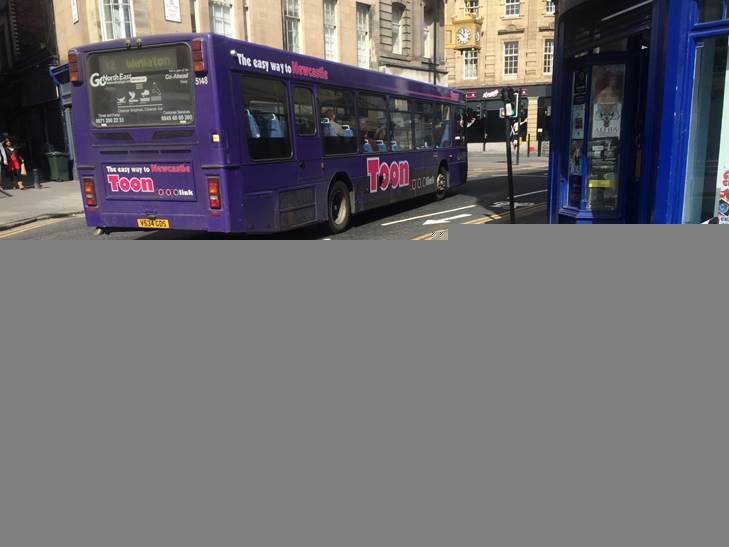 This is made worse by the (heavy) bus traffic along that stretch – buses are longer than cars and have a greater swept path area – again reaching dangerously close or even into the cycle space. Could this please be reviewed and physical separation be installed? Or maybe there was a stage 2 planned for this in any case. Please install this at the earliest convenience, keeping the clear cycling width of min 1.5m as per DfT guidelines. The entry and exit points may also warrant including in your safety audit. Let’s work together to make this contraflow work. 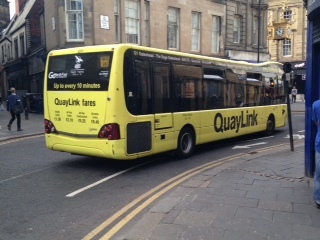 It’s the first in Newcastle, and getting this right is vital, we think. Happy to meet on site. Thanks to James and Rupert who supplied the photos.